Chicken soup cures a cold…and is good for the soul! Apologies for the lack of posts this last week. I’ve been ill in bed with the flu! I haven’t been this unwell for over two years, when we were packing up our life in London, moving home, country and continent to live in Africa for four months. All the stress of London living and the busy schedules got to me and I ended up with a chest infection that lasted most of our Ugandan trip. Thankfully, this time round I’m in wonderful peaceful Oxford, where I can put my feet up and rest for the entire bank holiday weekend secure in the knowledge that my friends understand that I’m too sick to be my usual sociable self. And to help me on the mend there’s nothing better than a large bowl of steaming hot chicken broth noodle soup to get me back into fine spirits. According to scientific research, there is more to chicken broth than just a cold comfort. In fact, home made chicken stock contains the compound carnosine which helps the body’s immune system fight flu. I love adding other extra viral fighters – including plenty of garlic, ginger and greens – to create an all in one health elixir. Chicken soup is not only good for the body and soul, it’s cheap to make too. Simply simmer your leftover roast chicken bones with two pints of water, a chopped onion, 2 garlic cloves, celery sticks, bay leaves and salt and pepper for about 2 hours. Strain off the bones. 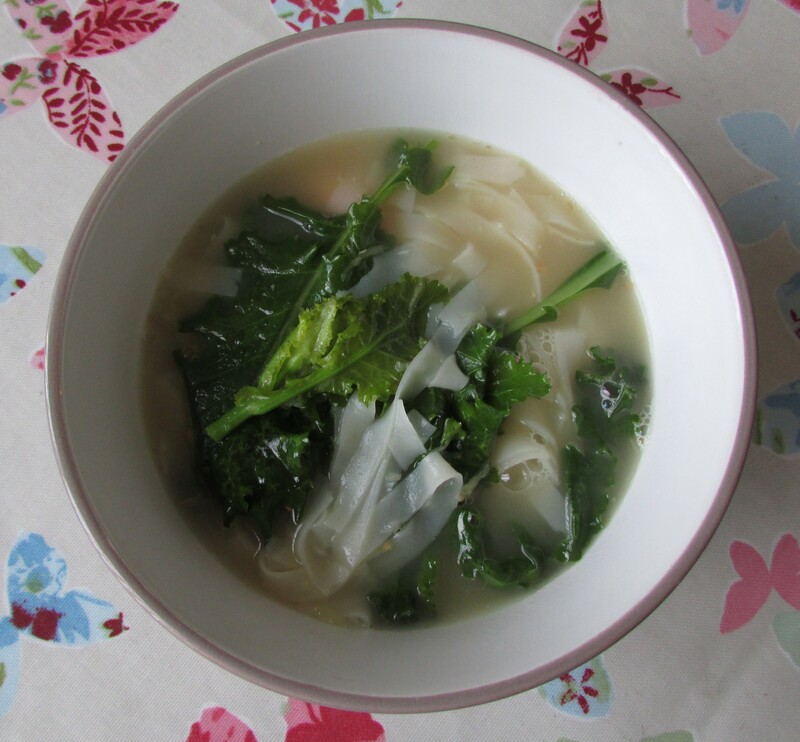 To the stock add a portion of your favourite noodles, a tablespoon of grated ginger and another of grated garlic plus a handful of greens and simmer for 2-3 minutes. Serve in a generous bowl with a sprinkling of soy sauce to season. Absolutely delicious. I can feel my sinuses clearing already! This entry was posted in Food scrap meals, Frugal Family Meals on May 6, 2015 by carolinementzer.